We always love going to Gen Con and seeing all of you awesome fans, and we're happy to report that this year was amazing for us! 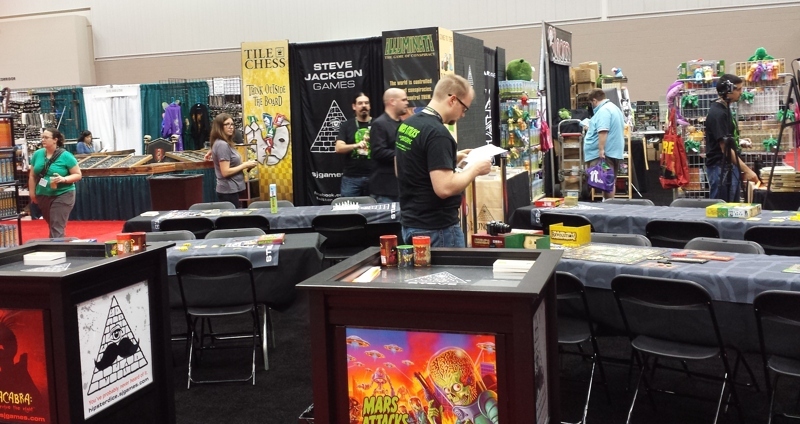 Our friends at Adventure Retail brought advance copies of a bunch of our upcoming releases to sell at the booth: Mars Attacks! The Dice Game, Car Wars Classic, Munchkin Adventure Time, Knightmare Chess, Revolution! Anarchy, and Hipster Dice. All of those sold through at the show. Thanks so much for your support! We also got to attend some special events. The good folks at DFW Nerd Night put on a huge gaming party for charity, in the main ballroom of historic Union Station, to support a food bank in Indiana called Gleaners. We were able to donate a ton of door prizes for the party, including one copy of Cthulhu Dice for every attendee. Also, we gave swag to the annual NASCRAG Pathfinder Tournament this year, including a copy of Munchkin Pathfinder Deluxe for the winning team. We also got the chance to do a number of interviews and media appearances. Here's Andrew with Jeff McAleer from The Gaming Gang; stay tuned to our Twitter feed for more interviews from the show as they go live! Overall, the show was an incredible success, and we're looking forward to next year!